'I was quite surprised, really,' remarks pop's greatest deadpan front-man, Neil Tennant, a propos the Pet Shop Boys' recent Outstanding Contribution to Music Brit Award. 'I thought it was nice of the industry to give it to us,' he concurs with a shrug. But what's truly startling about the electro-pop duo joining the ranks of Queen, David Bowie and U2 is that it didn't happen sooner. Pet Shop Boys have embodied and accelerated UK pop culture for 25 years. It's a feat that's seen them shift 50 million albums; reap 39 top 40 singles; glorify Dusty Springfield ('What Have I Done to Deserve This? '); outshine Elvis ('Always On My Mind'); and even cast Gandalf (well, Ian McKellen) as a vampire in the video for cardiac disco brouhaha, 'Heart'. They've written hits for Girls Aloud, Robbie Williams and Liza Minnelli; galvanised Madonna, Lady Gaga and The Killers. Little wonder David Tennant picked his equity surname in homage to Neil. The dancefloor colonists remain insatiable: this, their tenth studio album is a euphoric synthesis of the banal and cerebral; of music and art. Celebrity fetishism ('Love Etc') and image neuroses ('Beautiful People') dice with American politics ('More Than a Dream') and confined ideologies ('Building a Wall'). Titular brevity has long been an emblem in the PSBs' pop idiom, from debut album designate Please (1986) through to Fundamental (2006). No surprise then when they go and call their album something like Yes. 'It's called Yes because, erm …' Tennant falters. 'Well, it's one of our jokey titles, like, "have you got the Pet Shop Boys' Please?"' he quips. 'So if you go in and ask for this one, you could say, "the Pet Shop Boys' Yes?"' He skips a beat and smiles weakly. 'It's pathetic really. 'Our natural instinct would be for it to say "no",' interjects his insouciant counterpart Chris Lowe, to laughter. Pet Shop Boys have long cast themselves as part comedic double-act, with synth-virtuoso Lowe providing robotic foil to Tennant's stately chorister. It's a union that's prevailed for decades, and isn't set to waver – as a new album, upcoming T in the Park headline show and impending ballet will attest. Another 25 years from PSB? Yes. Please. Yes is out Mon 23 Mar. 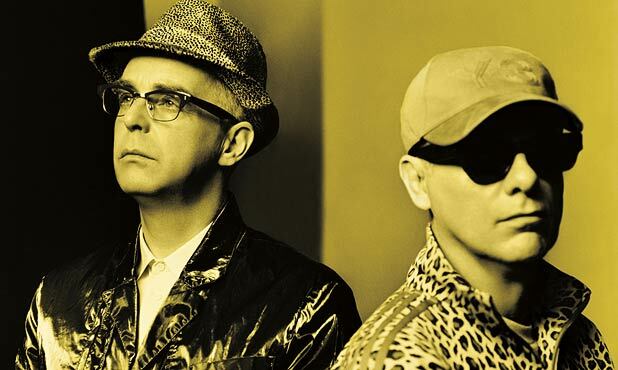 The chart-topping veteran duo of Neil Tennant and Chris Lowe plays its synthpop, new wave and alternative dance hits including 'West End Girls' and 'It's A Sin'.